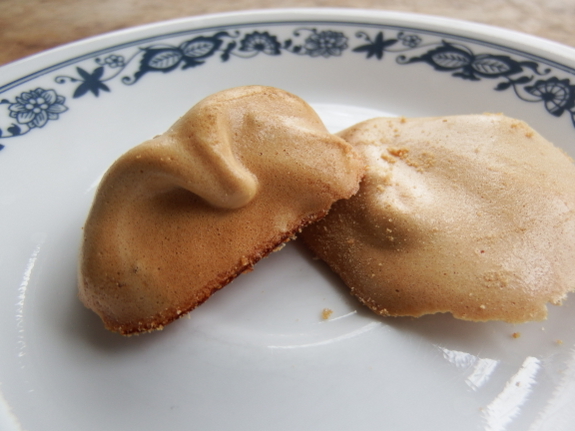 The first recipe I tried with our homemade maple syrup was meringues. I'm looking for a recipe that you can make using homegrown ingredients and that really showcases the maple-syrup flavor, and the meringues came in as a definite...maybe. The sticking point (quite literally) is that if you don't have parchment paper, your dessert will crumble to pieces when you try to pry the cookies off the pan. Also, Mark didn't realize until prompted that the cookies were made with maple syrup --- instead, he felt that they tasted like vanilla wafers. Still tasty enough to eat up all the crumbs, though! Preheat the oven to 200 F. Beat the eggs until soft peaks form, then add the maple syrup and salt. Mix lightly, then spoon onto a cookie sheet (or two) lined with parchment paper. Bake in the middle to upper rack for 60 to 75 minutes, until the meringues are starting to turn golden brown. The maple syrup means that these meringues will cook a shorter time than that listed in most recipes, so be careful not to let them burn! In other syrup-related news, we've produced about a pint of syrup so far in 2015, and I'm starting to work the kinks out of my low-tech production methods. When I bring home a bucket of sap, I immediately put the liquid in a skillet on the wood stove if we're currently heating the house. Unattended (perhaps over multiple days if the weather is warm), I cook the sap down until it's perhaps a fourth of its original volume, then I sock that concentrate away in a big jar in the fridge until I've got about half a gallon to a gallon of the condensed sap. When the fridge is getting overloaded with sap jars, I throw the condensed sap back on the wood stove until it once again cooks down to a fraction of its original volume. When I start seeing white bubbles, though, I take the skillet off the wood stove and put it on the electric stove where I can monitor it more closely. 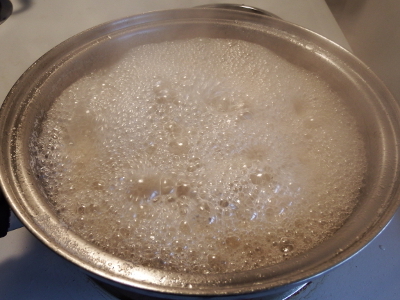 Next, I cook on medium to high heat until foam over --- when the sap suddenly starts creating a huge amount of big white bubbles that fill the entire pan. At this point, I stir frequently and watch the clock, aiming for 1.5 to 2 minutes of further cooking to create the perfect maple syrup. 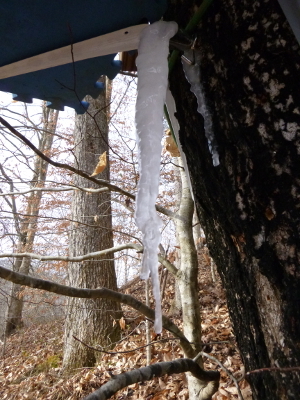 As you can see from the sap-sickle at the top of this post, our weather is still too cold for strong sap runs, but we've had a few good days so far. It sure is fun to come home from my morning walk with a bucket of subtly sweet liquid that I know will turn into a delightful project and a delicious addition to our late-winter meals! Anna - thank you for posting about your small scale syruping. We have a ton of sugar maples on our property, but they are mostly up steep slopes and widely dispersed. Hubby and I had discussed adding syruping to our homestead endeavors, but the idea of running tubes all over the acreage and building a sugar shack to do the boiling was daunting me to the point I thought we would never start. Watching you do your experiments with one tree and one bucket at a time has been the perfect encouragement for us to start small, rather than try and set up a larger system all at once. I really appreciate your low-effort methods and will probably be emulating them next year. Cheers! Also: Happy early birth-day to your lovely Abigail! Hope everything goes smoothly. This seems like a nice, slow approach to syrup making, as opposed to boiling down 80 gallons over a weekend... but do you have any issues with the steam rising from the sap condensing into a sticky mess inside the house? conventional wisdom here says the sap is ready when it reaches 7 degrees F. Above whatever boiling temp is. Native Americans here used to freeze the raw sap, as only the water portion will freeze. Remove the ice, freeze again, etc. 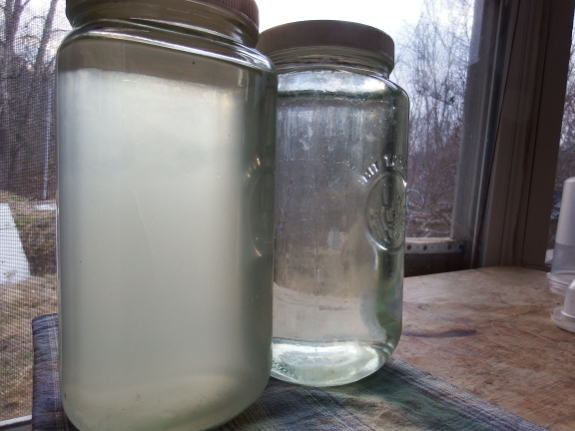 I am going out today to look for a larger container for the raw sap. We are not quite ready to tap yet, but it will likely be soon. Unfòrtunately, I am going to have to shovel paths through nearly five feet of snow to get to most of my trees. 😕 and be very careful how high I place the faps,mor they will be 7 feet above ground when the snow melts! That first picture made my mouth water! Meringues (especially maple syrup merignues) are now on my list of things to make with the egg whites leftover after making eggnog. Karen --- I know what you mean about being daunted by big projects. Luckily, if you keep it down to a tree or two, tapping maples is easy and fun! Deb --- I haven't noticed any stickiness to the steam (and there shouldn't be any since only the water should evaporate, leaving the sugars behind). That said, you wouldn't want to boil off a lot of sap in the house or you'd end up with a water problem like in a bathroom after you shower. Luckily, we're keeping our operation small, and the winter air needs humidified anyway, so it's not a problem. Good luck with your taps! Josh --- We went through a yogurt-making phase, then stopped. But once we have homegrown milk, I suspect we'll start making it again. It does sound like adding maple syrup to yogurt would be delicious!